ONBEAT magazine is a bilingual art magazine which introduces Japanese art and culture. Vol.10 highlights manga: It introduces article by Nicole Rousmaniere, the curator the Citi exhibition Manga (23 May–26 August 2019) of the British Museum and also has a special one-on-one talk article about Osamu Tezuka, god of manga. A new series “Art Patronage Today" has started: It features Stephen Globus, NY venture culturelist and provocateur who has been supporting Japanese artists in NY. Toyama's famous festival Owara Kaze-no-Bon is featured in “Japan Festival" series. Enjoy its magical feeling! 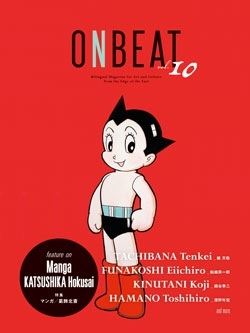 ONBEAT runs articles of various Japanese artists from ukiyo-e to modern art. Vol.10 features Tenkei Tachibana, Koji Kinutani, Toshihiro Hamano and Katsushika Hokusai. Copyright© 2010 shinanobook.com All Rights Reserved.